Mica told us last week, "I want to play the baritone in band. 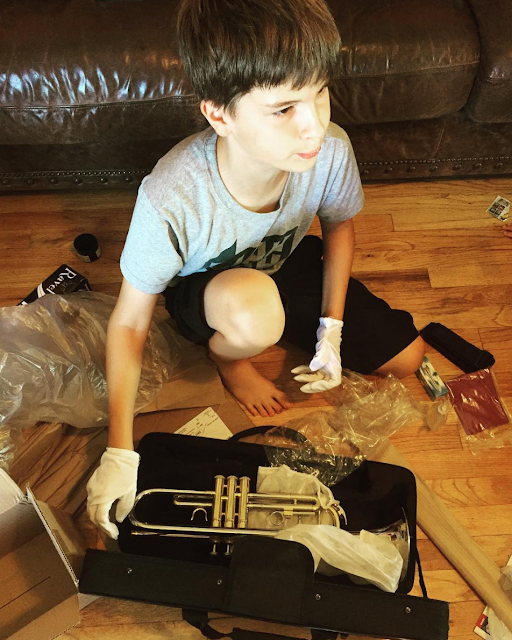 We need the instrument by Friday." The band form had no date on it whatsoever. I was kind of annoyed because he could have given strings a try last year. We have plenty of those instruments. Travis' boss gave him like 5 string instruments. Mica never told us about that. I got on him to be more informative, and to try new things. When I looked at the prices on renting an instrument I was like, "Whoa we need to make a choice here: Band or Martial Arts. I can't afford both!" Mica said, "You did tell me to try new things." So he had me there. I looked at pawn shops, but they really only had old trumpets that looked dinged up. Someone on facebook said they had a trumpet they wanted to sell. I said, "Sold!" It turned out that her Dad sold it without her knowing. We gave up on the baritone at this point. Mica's like, "I want a trumpet." 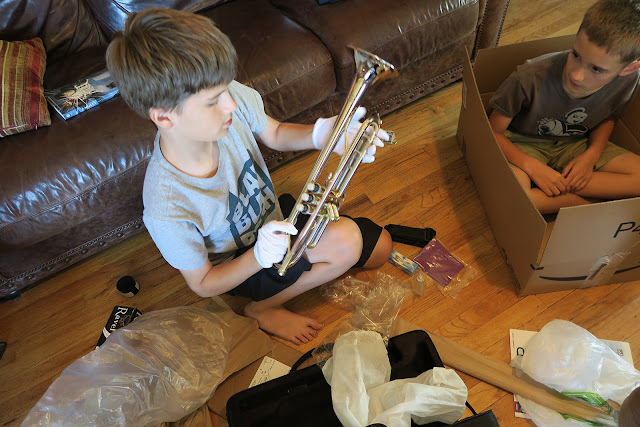 I checked out Amazon, and boom they had new trumpets for about the same price as the old ones in pawn shops. They could get it to us in 2 days, we read ratings, and it came with a case, gloves, and a few other things. Mica: Is this how I blow my trumpet? Travis: Ya but you have to blow with your cheeks in. 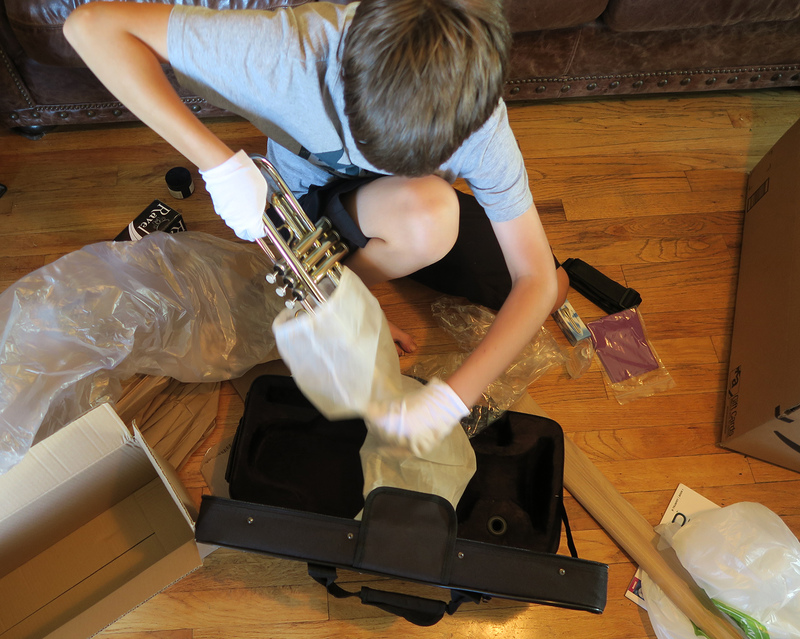 It turns out that after all this Mica didn't need his instrument for a few weeks. He's super excited to have it. 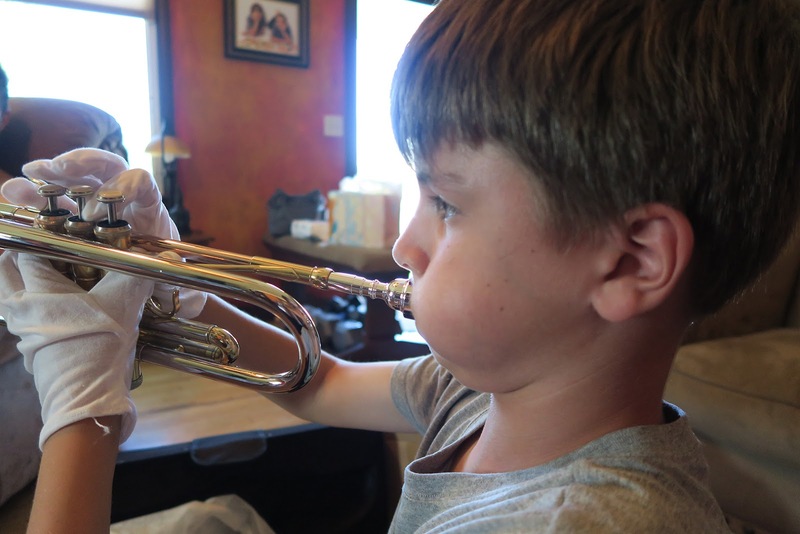 He watched the DVD that came with his music book, and now blows with his cheeks in. Mica has big plans! He wants to learn to play Peter Gabriel's Sledgehammer. He said, "Dad can be Peter Gabriel, and you can be a background singer Mom." I said, "Why don't you start with Twinkle Twinkle Little Star as your goal?" Isaak on the other hand is living in a box. He's living in a cardboard box. Did you play an instrument when you were a kid, or do you still play an instrument now? My husband got a trumpet but I never heard him play it ever. My son is learning how to play the violin but I can see that he is not that keen lately. I play a wee bit guitar and my son sing for me. Mica looks so into it and thats amazing! A great instrument to play!! There must never be a dull moment in your house! And probably not a quiet one, either, if he gets serious about playing the trumpet and practices every day! Your boys are awesome :) So glad the trumpet worked out, even if his messages were a little mixed up. 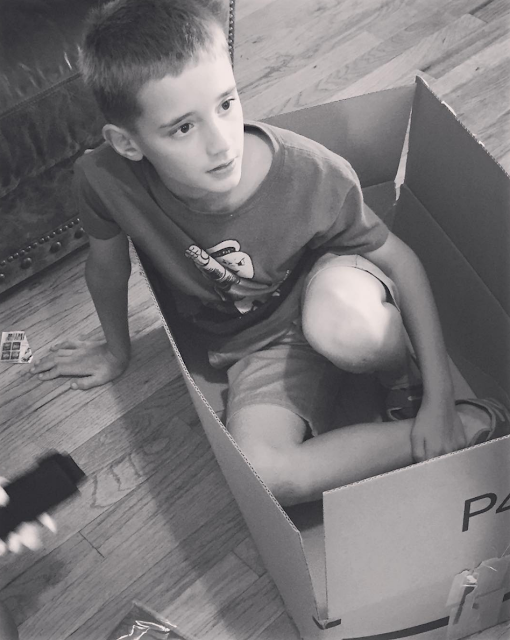 And I love the boy in a box! Good for him for trying a new instrument! I wanted to play something when I was in middle school, but my mom was a single mom of 4 and couldn't afford the class. Hopefully, he sticks with it and enjoys it. So glad that you were able to find one. Broxton has said he wants to play the drums.. not a drum in school band. DrumS like a rock band drums. Umm... I just do not think my sanity can take that right now, so I said no. How he puts it to good use. We have my husband's old saxophone if any of the boys want to play that.